The pool is a natural environment, subject to biological and climate changes: sunshine and UV, water and air temperature, type of water treatment used, and so on. Changing any one of these parameters affects all the others, and can thus create an imbalance. Balance is restored by corrective action on the water in the pool, taking all the parameters into account. But no matter what correction is made, the dose has to be carefully and accurately measured, to restore and then maintain this fragile balance. The BioClimatic Pool by Klereo™ concept considers the pool as a whole, applying a process for maintaining the balance rather than a global intervention (general addition of chlorine for instance, or continuous filtering), which normally only helps to exacerbate the imbalance. 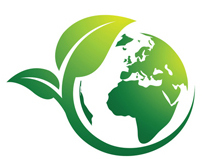 It is a matter of considering all the bio-climatic factors which operate on the state of the water in the pool, controlling them accurately and sensibly, with the correct dosage to maintain good quality water at all times. All too often, it is the swimmers who pay the price of the approximate doses and the use of incorrect chemistry. The balanced Bioclimatic pool environment controlled by Klereo ensures quality water which does not irritate the eyes, the respiratory system, skin or mucous membranes, and so helps to keep the pool what it should always be, a pleasure to use ! Klereo Kompact+ M1 combines all the essential features of the swimming pool. It is affordable and good value for money. 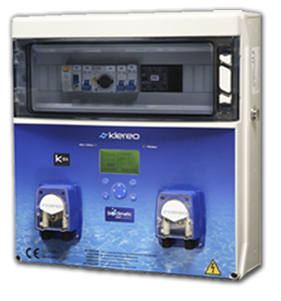 With its integrated electrical box and 9 connections, Klereo is ready for immediate installation and use. Optimum water quality throughout the year.